Can the Jewish People Survive Without an Enemy? 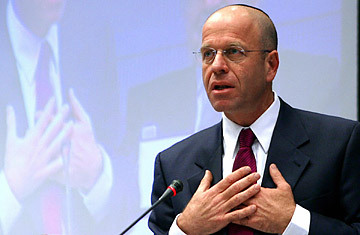 Avrum Burg is the scion of one of Israel's founding families  his father was the deputy speaker of the first Knesset, and Burg himself later became speaker of the legislature, and a member of Israel's cabinet. His position at the heart of the Israeli establishment makes all the more remarkable his critique of the Jewish State, which he claims has lost its sense of moral purpose. In his new book The Holocaust Is Over: We Must Rise from Its Ashes (Palgrave/MacMillan), he argues that an obsession with an exaggerated sense of threats to Jewish survival cultivated by Israel and its most fervent backers actually impedes the realization of Judaism's higher goals. He discussed his ideas with TIME.com's Tony Karon. TIME: You argue that the Jewish people are in a state of crisis, partly because of the extent to which the Holocaust dominates contemporary Jewish identity. Can you explain? Burg: I, like many others, believe that a day will come very soon when we will live in peace with our neighbors, and then, for the first time in our history, the vast majority of the Jewish people will be living without an immediate threat to their lives. Peaceful Israel and a secure Diaspora, all of us living the democratic hemisphere. And then the question facing our generation will be, can the Jewish people survive without an external enemy? Give me war, give me pogrom, give me disaster, and I know what to do; give me peace and tranquility, and I'm lost. The Holocaust was a hellish horror, but we often use it as an excuse to avoid looking around seeing how, existentially, 60 years later, in a miraculous way, are living in a much better situation. In your book, you raise the question of the purpose of Jewish survival over thousands of years, insisting that Jews have not simply survived for the sake of survival. What is this higher purpose? Both my parents were survivors  my father ran away from Berlin in September 1939; my mum survived the 1929 massacre in Hebron. So, my family knows something about trauma. Still, my siblings and I were brought up in a trauma-free atmosphere. We were brought up to believe that the Jewish people did not continue in order to continue, or survive in order to survive. A cat can survive  so it's a circumcised cat, so what? It's not about survival; survival for what? Look at the Exodus: After 400 years of very aggressive oppression and enslavement, all of a sudden the outcry was "Let my people go," and that continues to resonate against slavery everywhere to this day. Then we come to the Sinai covenant, which is a key moment not just for Jewish theology, but for Christian belief as well: The Ten Commandments is the first human-to-human constitution, setting out the relations among humans on the basis of laws. And then you come to the Prophets, and its amazing that they're calling so clearly for a just society. And then, in the Middle Ages, you listen to Maimonides say he's waiting for redemption of the world without oppression between nations. So, in the Jewish story over so many centuries, there has always been a higher cause, not just for the Jews, but for all of humanity. Even in the Holocaust, the lesson is "Never Again." But this doesn't mean just never again can genocide be allowed to happen to the Jews, but never again can genocide be allowed to happen to any human being. So, the Holocaust is not just mine; it belongs to all of humanity. Both the internal and the external hemispheres of the Jewish experience are essential. I cannot envisage my Judaism without the input I got from the external world, be it philosophy, aesthetics, even democracy, which was introduced to the Jews in the last 200 years because of our interface with the the world. On the other hand, I can't imagine my Western civilization and Western culture without the Jewish input, without Jesus Christ, who was born, was crucified and passed away as a Mishnaic rabbinical Jew. I cannot image Christian Europe opening up to modernity without a Maimonides reintroducing Greek philosophy. I cannot imagine modern times without a Spinoza, and Mendelson. I cannot imagine the 20th century without Marx and Freud. So, this conversation between Jews and the world is not just a conversation of pogroms and slaughter and Holocaust; it's also a couple of thousand years of a conversation that enriched me and enriched them, and I don't want to give that up. The Holocaust is a very real trauma for many people in Israel, and nobody can argue with that. But ... when I hear someone like Benjamin Netanyahu, who is a very intelligent person, say of [Iran's President Mahmoud] Ahmadinejad, "It's 1938 all over again," I say, is it?! Is this the reality? Did we have such an omnipotent army in 1938? Did we have an independent state in 1938? Did we have the unequivocal support in 1938 of all the important superpowers in the world? No, we did not. And when you compare Ahmadinejad to Hitler, don't you diminish Hitler's significance? The sad thing is that whenever a head of state begins a visit to Israel, he doesn't go to a university or to the high-tech sector or the beautiful cultural places we have in Israel; first you should get molded into the Israeli reality at [the Holocaust memorial] Yad Vashem. And I do not think that Yad Vashem should be the showcase or the gateway through which everybody should first encounter Israel. Part of the program, yes; but the starting point? This is not the way to baptize people into an encounter with Judaism. Look where we were 100 years ago and look where we are today  no other people made this transformation. Imagine we did not keep the shadow of the trauma looming over ourselves daily, what could we have been? How come 25% of the Nobel laureates in certain fields are of Jewish origins, and 10% of the arms deals around the world are done by Israelis? Why is my brother or sister in America a great poet or composer or physician whose achievements raise up all of humanity, and I who live here on my sword became a world expert on arms and swords? Is that really my mission, or is that an outcome of the black water with which I water my flowers? To make our contribution to humanity, we have to free ourselves of the obsession with the trauma. Many Jews, in Israel and in America, see Israel as surrounded by deadly threats, and would see the benign and peaceful world you describe as a dangerous fantasy. What do you say to your critics? I have very low expectations of new thinking and insight emerging from the mainstream Israeli and Jewish establishment. Their role is to maintain the status quo. Israel is bereft of forward thinking. We are experts at managing the crisis rather than finding alternatives to the crisis. In Israel you have many tanks, but not many think tanks. One of the reasons I left the Israeli politics was my growing feeling that Israel became a very efficient kingdom, but with no prophecy. Where is it going? My idea of Judaism can be represented through a classic Talmudic dilemma: You are walking along by the river and there are two people drowning. One is Rabbi [Meir] Kahane, and the other is the Dalai Lama. You can only save one of them. For whom will you jump? If you jump for Rabbi Kahane because genetically he's Jewish, you belong to a different camp than mine, because I would jump for the Dalai Lama. As much as he's not genetically Jewish, he's my Jewish brother when it comes to my value system. That's the difference between me and the Jewish establishment in Israel and America. But how can this new thinking you're advocating help Israel solve its security problems? Many people say to me, "What about Gaza? Don't have so much compassion for them, don't tell the Israelis to be nice there, tell [the Palestinians] to be nice there. And I say Gaza is a nightmare, and it's a stain on my conscience. And I'm very troubled by the attitude of Israelis against Israeli Arabs. It's a shame. It's a black hole in my democracy. But I say sometimes that I'm too close to the reality; I don't have the perspective; I don't have the bigger picture. But if enough of my kids and enough of my youth will go to volunteer, be it in Darfur or be it Rwanda, or be it in the squatter camps of South Africa, they will sharpen their sensitivities. And they will come back and say, listen, if we can do so much good out there, let's do something over here. And I see my own kids, when they come back from India and from Latin America, how changed they are as people. I see my son, after one and a half years in Latin American. He came home, and five days later, was called for 30 days "miluim" service [with his military unit] in the West Bank. And he was sitting in the worst junction in the West Bank. And he says, "When I look around me 360 degrees, nobody loves me. Settlers, Kahanes, rabbis, mullahs, Hamas, Palestinians, you name it  they all hate me. And he told me, "Here I was sitting on a corner one day; it was my break time, and I was drinking coffee with a friend of mine, and out of the valley climbed an old Arab. He was very bent forward and frail, and walked slowly to us and said 'Here is my ID.' And we told him, you don't have to give us your ID; we didn't ask for it. And he said 'No, here it is, I want you to look at it. Look at it, I'm okay, I'm kosher, I'm kosher.' I checked it and let him pass, and then I began crying and crying." So, I asked my son, why did you cry, what happened? And he said, "You don't understand that for a year and a half, I was in Latin America, going to small villages and sitting with this kind of man, listening to their oral tradition, to the beauty of their history, to the wisdom of their culture. And they shared it with me. And now here I am, the policeman, here I am the bad guy, here I am the occupier. And I can't talk to this man. You know how much he could tell me under different circumstances?" And I say, that's an example for me.